fits mattressess 39" x 75"
fits mattressess 60" x 80"
fits mattressess 78" x 80"
fits mattressess 72" x 84"
The Max 4 Camo Sheet Sets feature the favorite camouflage pattern of waterfowl hunters. The variety of plant life incorporated into this pattern includes cattails, corn stalks, and sunflowers as well as oak and maple leaves. 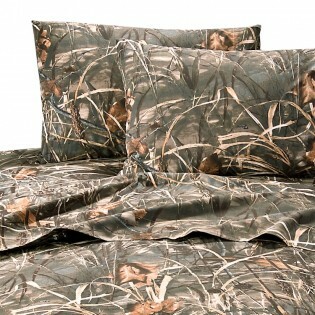 This camo pattern has a medium to medium light appearance.